Over the last few months, I've seen so many people ask some iteration of this request in Facebook outdoor groups: "I'm going to Yosemite for x days and need day hiking/ backpacking/ lodging advice!" I have a lot of thoughts and feelings and advice for this question, just because I love Yosemite so much and want others to experience the magic! I will not be going into a big in-depth description of hikes, or permit information, but I will leave some helpful links at the bottom of this page to assist you in planning. I also want to note that I have not done all of the below hikes. The ones that I have done personally, I will denote with an *. Mileage and elevation gain are listed as round-trip unless otherwise noted. Mileage & elevation gain calculated using GaiaGPS. All I ask of those using this information is to please abide by the rules & regulations in the park regarding safety, and Leave No Trace principles. Lower Yosemite Falls*: A super easy paved stroll up to the footbridge at the base of lower yosemite falls. Climb on the rocks below the falls at your own risk (people have died there). You can go back the way you came, or make a longer loop by following the posted signs. 1 mi. Mirror Lake*: A partially paved hiking and biking trail to the seasonal Mirror lake. If you have a handicap placard for your car, you can drive the paved road to the lake. If you'd like to hike more, you can follow the trail to the backside of Mirror lake and circle around back to the shuttle stop. 2-5 mi. Yosemite Valley Loop Trail: A dirt/ paved combo trail that parallels southside and northside drives and encircles Yosemite Valley. Is ~13 miles total, but can be used to access areas of the valley floor that the shuttle bus doesn't reach and you can enjoy the Merced River & quieter parts of the valley. 13 mi. Mist Trail - John Muir Trail Loop*: The iconic Mist trail is a definite must-do in Yosemite. You will see Vernal and Nevada Falls as you climb the infamous, tall, wet, slick, granite steps. Most people opt to go up the Mist trail and down the John Muir Trail. A friendly reminder that there are many, many people who hike the Mist trail each day. Patience will go a long way. Don't speed past people on the tall steps - its easy to lose balance. If you're going slow, pull over and let people pass you at safe, wide spots. If you don't want to go to the top of Nevada Fall, use the connector trail past the pit toilets above Vernal Fall to connect to the JMT to go down to the valley. 6 mi, 3,000 ft gain. Upper Yosemite Falls*: You may curse switchbacks forever after hiking this trail, but I promise the views of Half Dome are worth it! If you can't make it the whole way, you can turn around at Columbia Rock. 6 mi, 3,800 ft gain. 4 Mile Trail*: The 4 mile trail boasts amazing views of the valley, El Capitan, Half Dome, and Yosemite Falls. You get a little bit of everything on this hike! Contrary to popular belief, the hike is actually 4.7 miles to Glacier Point. 9 miles, 4,000 ft gain. Snow Creek Trail*: To access this trailhead, you'll need to follow the paved trail to Mirror Lake and then continue on the trail to the back end of the lake. 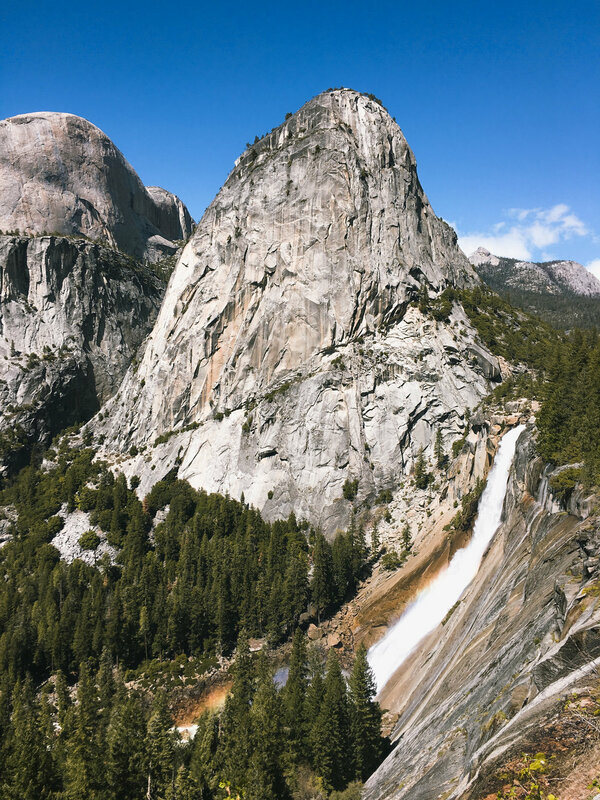 You'll have stunning views of Half Dome, Tenaya Canyon, and Tenaya Creek Falls. It is the steepest climb out of the valley, so be prepared! 7.5 mi, 3,000 ft gain. It's worth noting that the elevation gain occurs during the middle 3 miles. 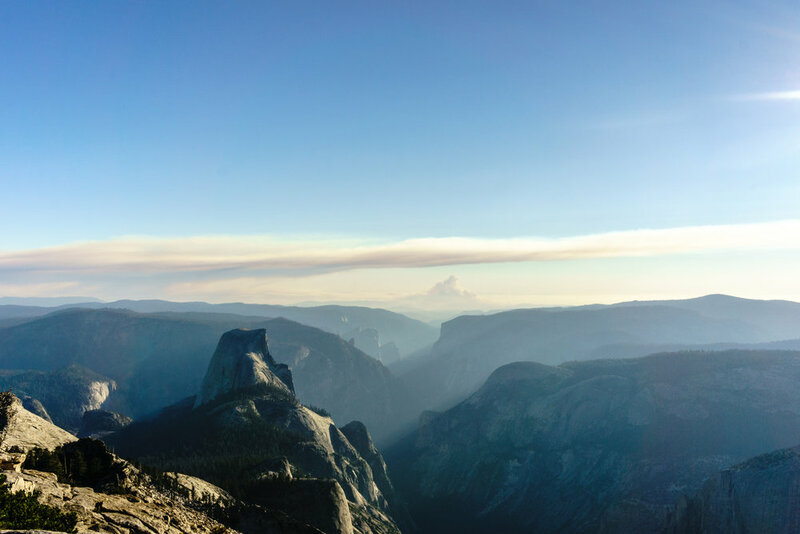 Half Dome Hike*: One of the most famous hikes in the world! It is long, strenuous, and nerve-wrecking. Permits are required to ascend the cables (cables up Memorial Day weekend - approx. Columbus Day), and there is a ranger checking for permits every day. I highly recommend bringing nitrile gardening gloves to help your hands grip the cables! 15-17 mi, depending on route, 5,500 ft gain. Glacier Point*: A super short, paved walk from the parking lot to the main viewpoint. Taft Point: Relatively easy hike to a beautiful viewpoint of Yosemite Valley, particularly of El Capitan and the west valley. 2.25 mi, 400 ft gain. Mariposa Grove of Giant Sequoias*: Visit some of Yosemite's oldest and most beautiful Sequoia trees. This grove is reopening June 15, 2018 after rehabilitation of the area. You can read about the restoration here. Dewey Point via McGurk Meadow: Hike through forest and meadow to the Southern Rim to see amazing views of the valley from above, particularly, El Capitan. Summer. 7.5 mi, 1,250 ft gain. Dewey Point Snowshoe*: There are two routes, the meadow route via Summit Meadow being easier. Beautiful snowshoe along Glacier Point Road and then through meadow and hilly forest to Dewey Point. Winter only. 7 mi, 1,000 ft gain. 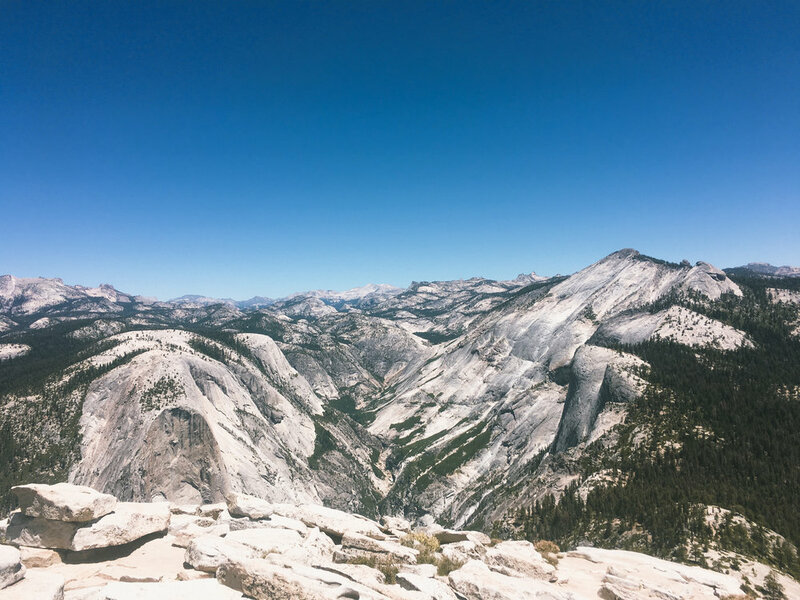 Sentinel Dome: Hike from Glacier Point to a dome about 1,000 ft higher with a different view of Half Dome and the high country. 2.75 mi, 850 ft gain. Ostrander Lake: Hike to a beautiful backcountry lake. There is also an option to ski/ snowshoe this route to the ski hut in the winter for advanced winter travelers. This is a long summer day hike, but the reward is swimming in a pristine lake! 12 mi, 1,900 ft gain. Chilnualna Falls: One of the few hikes in the Wawona area, you'll see a beautiful cascade & some potential swimming holes as long as the water isn't flowing too rapidly. 8 mi, 2,500 ft gain. Pohono Trail: A trail connecting Glacier Point and Tunnel View that hugs the southern rim. You will pass by Crocker, Stanford, Dewey, and Taft Points and have amazing views of Yosemite Valley. 13 mi one-way, 5,000 ft descent, 2,200 ft ascent (beginning from Glacier Point). O'Shaughnessy Dam*: If you just want to stretch you legs at Hetch Hetchy, you can walk the dam and read all about the history, construction, and controversy about the dam at the interpretive signs. You can also walk through the tunnel, which is pretty cool! Walking to the first signed trail junction and back is 2 miles, with negligible elevation gain. 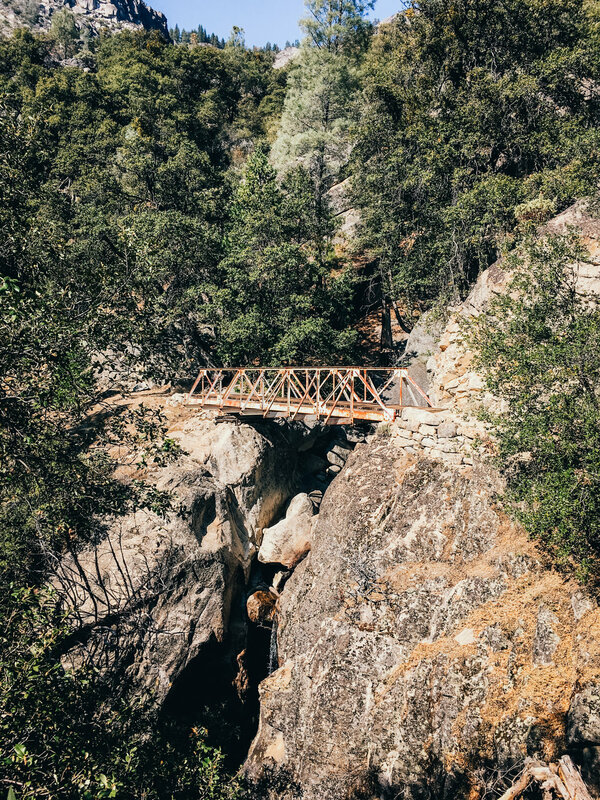 Wapama Falls*: Best to visit in late winter, and spring, these falls are strong-flowing, and you'll walk right over their outflow to Hetch Hetchy over steel bridges. 4.75 mi, 1,600 ft gain. Rancheria Falls*: If you continue on the trail past Wapama Falls for another 4 miles, you'll come to Rancheria Falls, another super powerful waterfall. 12 mi, 4,500 ft gain. A note about Hetch Hetchy: This is a separate park entrance off of Evergreen Road. Keep your NPS entry receipt if you entered the park elsewhere before. The Hetch Hetchy gate opens & closes at different times throughout the year, you must exit before the gate closes if you are day hiking. Harden Lake: A pretty, forested walk to the lake, near White Wolf. 5 mi, 500 ft gain. Lukens Lake: A short hike through lots of wildflowers to a small lake. 2 mi, 400 ft gain. Pothole Dome*: Not even really considered a hike, this is a hidden gem in plain view in Tuolumne. A short hike along a trail to the base of Pothole and then a very mild scramble to the top of the dome leads to amazing views of the meadows and mountains of the high country. Highly recommend hanging out at the top for sunset. 1 mi, 250 ft gain. 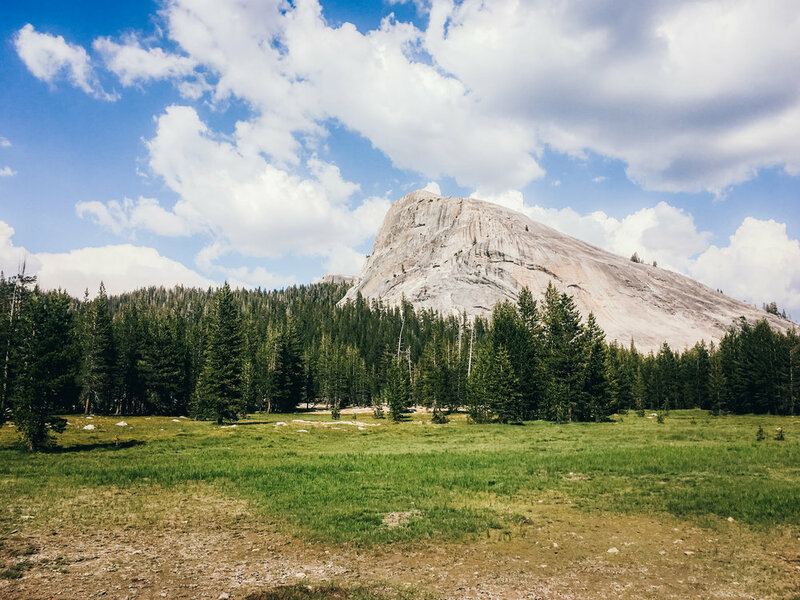 Tuolumne Meadows*: There are many little paths in the meadows to wander. Negligible elevation gain. Please stay on use trails to avoid trampling the meadows! Indian Ridge Natural Arch: See a cool natural arch feature off of Tioga Road. 6.5 mi, 1,300 ft gain. North Dome: You can reach North Dome from Yosemite Valley as well, but it takes much less effort to hike to it from Tioga Road. You'll have magnificent views of Half Dome and Yosemite Valley. You can visit the Indian Ridge Arch on the same hike, adding 1.25 miles and ~300 ft gain. 8.5 mi, 1,800 ft gain. May Lake*: May lake is absolutely beautiful. A pristine alpine lake with Mt. Hoffman hovering over it. It is also home to one of the High Sierra Camps and a backpacker's campground. There are 2 routes depending on if the road to the closest trailhead is open. Please DO NOT swim in the lake! It is a watershed. Longer: 6.5 mi, 1,000 ft gain. Shortest: 2 mi, 500 ft gain. Sunrise Lakes*: Starting at Tenaya Lake, you'll switchback up to 3 alpine lakes with sloping granite features. These lakes are perfect for swimming in (but they're icy cold), and the big rocks are great for sunbathing on. 6.75 mi, 1,600 ft gain. Cathedral Lakes: Probably two of the most stunning lakes in Yosemite's high country, especially with all of the 10,000+ peaks surrounding them. You'll also get to hike a little bit of the John Muir Trail. 7.5 mi, 1,600 ft gain to visit both lakes. Minus 1 mile if you only choose one. Elizabeth Lake: Another hike to another gorgeous high country lake. This hike begins in the back of the Tuolumne Meadows campground. 5.75 mi, 900 ft gain. Lembert Dome: Starting at the Lembert Dome/ Dog Lake trailhead, you circle behind Lembert Dome and then scramble up the giant granite rock to the top! This dome is much higher than Pothole Dome and has different views from the top! Either go back the way you came (longer), or finish the loop, linking up with Tioga Road or the PCT/JMT. 3.75 mi, 800 ft gain. Glen Aulin/ Tuolumne Falls/ White Cascade*: A gorgeous out-and-back hike along the Pacific Crest Trail, paralleling the Tuolumne River. Be sure to stop by Soda Springs on the way there or back to see the natural carbonated water! Be aware: the hike back is all uphill. 11 mi, 1,300 ft gain. Gaylor Lakes*: Very underrated, and unknown, but so, so beautiful. This hike starts at 10,000 ft, so even though the mileage isn't super high, it's pretty tough! There isn't the greatest trail after Middle Gaylor Lakes, but plenty of opportunity for off-trail travel to Granite Lakes and Lower Gaylor Lake, and the mine. 3.75 mi, 1,200 ft gain. Lyell Canyon via the PCT/JMT*: Hike one of the most famous trails in the world and travel in a beautiful meadow along the Lyell Fork of the Tuolumne. You can go as far as Donahue Pass, but that would be a 28 mile round trip hike. A trip of about 3-4 miles in would give you a good idea of the beauty. Mt. Hoffman: If you want to go past May Lake and challenge yourself, you can hike/ non technical scramble up to the top of Mt. Hoffman, which is the geological center of Yosemite National Park! Pretty cool. P.s. there is no official trail once you leave May Lake. Follow the cairns, and don't build any new ones! 5.75 mi, 2,000 ft gain (from the May Lake parking lot). Cloud's Rest*: A grueling but incredible hike to one of the most spectacular views in all of Yosemite. Arguably a better hike and view than the top of Half Dome! And by the way, you'll get a pretty sweet view of Half Dome from the top. 11.5 mi, 2,900 ft gain. Young Lakes: A hike I am just dying to do - Young Lakes looks stunning in all of the pictures and accounts I've seen & heard. There is just something so special about high alpine lakes! The trek to the upper lake is well worth the extra push. 14 mi, 2,600 ft gain. Mount Dana Summit: Want to do some peak bagging in Yosemite? Mount Dana should probably be on your list. Starting at 10,000 ft and climbing up to 13,000 ft in just over 2 miles, this hike is incredibly strenuous, but the views are amazing. 4.8 mi, 3,000 ft gain. I hope this guide is helpful! Have you been on any of these backpacking trips? Have advice about anything? Any questions? Drop a comment below or send me an email!